Dr. Sarah Whitley just secured her dream job at the prestigious Medical College of Louisiana. When the head of the anatomy department, Dr. Roberts, assigns her the task of preparing the cadavers for dissection, she sees it as an opportunity to expand her knowledge and instructional skills. But the cold, dark morgue hides grim secrets the dead won’t share. The Dissector gives the reader a unique glimpse at the dark underbelly of a medical school anatomy department. If you like captivating characters, unpredictable twists, and psychological suspense, then you’ll love L.L. Spriggs’ riveting tale of corruption and intrigue. 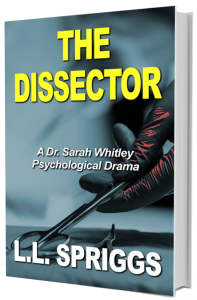 Buy The Dissector today to find out how Sarah resolves her precarious situation.